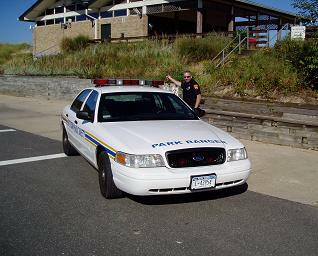 The Park Ranger Division is comprised of trained uniformed law enforcement personnel who actively patrol all Town parks, beaches and Town owned facilities. Under New York State Law, all Park Rangers are peace officers utilized to enforce Town codes, parks rules and regulations, as well as, state and federal laws. Park Rangers work in conjunction with the Suffolk County Police Department, the New York State Department of Conservation, other town departments and various state and local enforcement agencies. This Division is a 24 hour patrol operation responsible for maintaining order, preserving Town property, deterring crime (vandalism, burglaries of Town buildings, trespassing, public disorder, etc.) and arresting offenders. Park Rangers assist in searches for missing persons or children in our parks and beaches and furnish the public with information regarding park rules, regulations and procedures. Among their duties, Rangers respond to incidents such as motor vehicle accidents involving town vehicles and personnel to insure proper documentation of incidents and notification of appropriate outside agencies. Division personnel attend community meetings to discuss various situations which are of concern to residents and have given talks to community groups on several topics including park and beach safety and crime prevention. Can park rangers make arrests? Do any park ranger duties fall outside a park or beach? Do I need to be a resident of Smithtown to use the Smithtown parks and beaches?